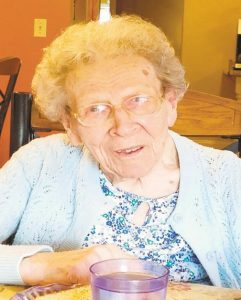 Helen Bernice (Weber) Kuhn, 101, of West Kittanning, died Saturday, Jan. 26, 2019, at Grey’s Colonial Acres. She was born Sept. 3, 1917, in Montana, to the late August and Marie (Strenstrom) Weber. Helen retired from Armstrong County Memorial Hospital from the housekeeping department. She was a member of St. John’s Lutheran Church in Kittanning, led by her pastor, Carl Johnson. She enjoyed traveling, cooking, gardening, and spending time with her family. She is survived by her daughters, Leota Minnich and Hazel Wiedl, and son, Neal (Veraline) Kuhn, all of Kittanning; daughter-in-law, Marilyn Kuhn Stahl, of New Jersey; six grandchildren, Susan (Howard) McElheny, Dan Minnich, Kathryn (Don) Peterson, Brad (Tina) Kuhn, Denise (Barry) Barnoski, and Sabrina (Russ) Baglivo; and nine great-grandchildren, Hannah Kuhn, Stefan Bleakney, Gretchen Bleakney, David Peterson, John Peterson, Ashlee Peterson, Spencer Barnoski, Ryan Baglivo, and Corey Baglivo. She was preceded in death by her parents; her husband, Berl Kuhn, who died on Dec. 7, 1959; her twin sister, Ellen Farester; a brother, Carl Ahlquist; and sisters, Ann and Effie Ahlquist, and a great-grandchild, Donnie Peterson. Services will be private and are under the care of the Snyder-Crissman Funeral Home in Kittanning. Interment will be in Lawn Haven Burial Estates in Worthington.